Helps to provide temporary relief of pain due to arthritis, tendonitis or chondromalacia. I have been diagnosed with quadricep tendonitis, has not ruptured but is in BOTH knees with some separation from patella. Would this possibly help? I am doing pt with trying to build the muscle. 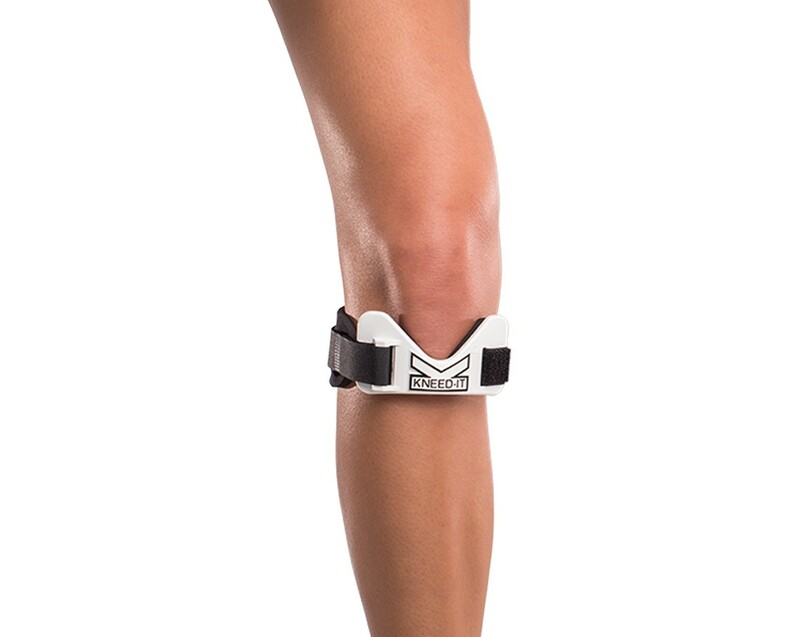 I have purchased this knee brace product and it works great. The comfort foam behind the strap is deteriorating. Can I purchase extra foam to replace only the foam piece? Ren I am sorry there is no replacment foam for this strap. Will the Kneed-IT magnet brace have any issue with screws in my knees? We do not have a Kneed It brace with magnets. I have a fracture of my left knee cap and wear a long Corflex brace. Might this keep me from bending the knee? The KneedIt is a patellar strap and will not restrict an knee movement. The TROM Advanced post-op brace is able to be locked in full extension and will not allow your kne to bend. I have been diagnosed with inflammatory arthritis of the knees. I was told the compression sleeve would work just fine. I am finding that the sleeve is causing hamstring pain behind my knees. I wanted to know if the kneed it brace would work for me. I need support for walking and working out with a trainer. Since the orthopedist has left it up to me I thought I would research braces. Thanks! I have IT band issues that affect my right knee. Doing a 1/2 marathon this weekend and looking for some support. Any suggestions? Is this a good option for that? I need a brace to help with patellar tracking, but it has to be neoprene free. I didn't see any info as to materials used in this brace, or is there other options. Thank you for your question. Drytex is an alternative for those with allergies to neoprene. It is a light weight, breathable material. The DonJoy Lateral J is an excellent brace for patella tracking (lateral tracking issues), this would be a very appropriate brace for you. So have had problems with dislocating knee caps it has happened a few times in both knees. and my doctor keeps telling me when it rains it pours and to wear a brace on both knees. however I have a problem with the bulk of the knee braces and was wondering if there was a minimalist knee brace that would help my knee stay on track. Hello, I have chondromalacia in both knees. I was wondering what knee braces would you recommend that will help ease the pain but also will give me full range of motion. Also, a knee brace that won't need much adjusting. Is a Jumper's Knee brace (infrapattellar strap) contraindicated in an individual with a DVT (anticoagulated)? Is one brand or style less restrictive to circulation than another? Thank you for your question. It would be recommended that you speak with your physician about using an infrapatellar strap if you have a history of Deep Vein Thrombosis. All of the straps will add compression around the knee circumference, and particularly on the tendon below the knee cap to help alleviate pain. I bowl and have arthritis in left nee (slide leg) will this help to keep cap in place ? The KneedIT Knee Band will help with mild arthritis and tendonitis. However if you are looking to keep the knee cap in place I would recommend a couple other options to you. My 12 year old daughter needs one of these braces. Repetitive Back hand springs cause pain in her knee. She is a tiny 12 yr old, Will this fit her? It will go down to a knee circumference of 11 inches. Hello! My hubby needs one of these but a he has an XL knee. Will this work for his knee? We have bought the one size fits most but those are simply not large enough. Please get back to me as soon as you can. He would appreciate it. You can try the Neoprene Version, these stretch. Please call us to speak to a Product Specialist, your brace has a 6 month warranty and may be returned. What knee brace do you recommend for patella femoral? I was diagnosed with it last summer. I was told do more stretches for quads, calves, hip flexers, IT band, etc. That worked for a while but now experiencing it again. I'm sure it's do to the fact that for years I've been running and doing aerobics without properly stretching which has probably done some damage to the patella. I will be making an appointment to see the doctor just to make sure. I am 44 and love floor aerobics. There's a lot of jumping and bouncing involved in this. I have stopped running. I am interested in a knee brace that would support the patella and be flexible for movement. Below are options you have for Patella Femoral Dysfunction. I recommend taking copies of the Braces below to your Physician and asking him which will be best for you. Or you may also get you Diagnosis and call us back to speak to a Product Specialist and we may then recommend the best suited brace. While I bought my Kneedit at my local pharmacy and paid a whopping $32.99 for it I feel it does help. Had surgery for a badly torn meniscus 17 years ago and have had daily pain since. Have tried many things which, of course, didn't help or only for a short time. Spent a day at an Oktober Fest which had minimal seating so had to stand for hours. The Kneedit eased my pain immensely. Seeing that it cost less on this site I will buy from here in the future. I'm a runner and have bought numerous products to relieve my knee pain while running. The KneedIT Knee Band fits well, stays in place, no having to continually adjust while running and completely relieves my knee pain associated with mild arthritis. Works so well I'm buying a second one. I am very pleased with this product. It has help my knee tremendously. My knee would buckle & I would almost fall. The kneedit helps to support it from falling. my right knee has deteriorated to the point that a complete knee replacement is required This brace is the only one I have found that will allow me to continue to play tennis 3 times a week. continued wearing the and day by day my knee got better the following week I resumed running pain free. Since then people have seen me wearing the and shared that they too suffered from knee I immediately recommended this brace to them. I know other people with different injuries and I refer them to Better Braces. Better Braces is a great company that puts out great products that work. Can't wear this on bare skin, causes chafing. I wear it on top of pants and it has to be re-positioned many times. Too tight and it causes swelling,not tight enough and it slips down. I wear it when walking, wish it had a better design. I have 2 very worn down knees, and they have helped me. So I would try them before you decide not to get them. It does work but I've had other knee supports for the patellar tendon that worked as well for less cost. Plastic piece across the front needs to be more flexible to shape to the knee better. May not be as big an issue if you have large knees/legs. Pros: Looks good visually. Easy on/off. Cons: The front plastic piece could be more flexible to contour the shape of your knee better. Had to cinch it down too tight to get the plastic to bend to knee. I have a fissure on the side of my knee (inside edge on the meniscus), this is the only product that has provided the proper support exactly in that area. It has given relief with less discomfort that other bulkier more restricting braces. I am a senior citizen. After a mountain bike accident (Manatou fork collapsed- turns out it was a prototype that should never have been sold) I gave up running 15 years ago. I am back running with this brace. Slow, but that is to be expected. Pros: Works without pressure on knee cap. Stabilizes the joint. Cooler than other types I have tried. Washes easily, dries quickly. Reasonable price, excellent quality.